As a nursery school educator, trying to find quality enrichment programmes for your children and at a price you can afford, can be a difficult task. You want to bring in someone excellent for your children, but the top quality professional entertainers many times just have fees that are simply beyond your budget. Of course you could always book someone cheap, but then that is like throwing darts blindfolded... you don't what will happen. You might get lucky, but more likely you will be stuck with a performer who is not very good, or even worse, not suitable for young children. Your search for quality entertainment and at a price you can afford is over, because... my Nursery Magic Show is absolutely amazing. Your kids will love the show and I can guarantee it will be one of the best programmes you will have ever brought into your school! Dear Franc, many thanks for coming to Hardgate Primary school to entertain the school and nursery children during our Wacky week. The feedback I have received has been really outstanding. The children thoroughly enjoyed themselves and by all accounts there were lots of squeals of delight and excitement!!! Your amazing magic show in the middle of our ‘Wacky week’ has been ideal. We look forward to having you back soon! Amazing Magic - with tonnes of audience participation. Hilarious Comedy - your kids will be laughing so hard during this roller-coaster of magical fun! 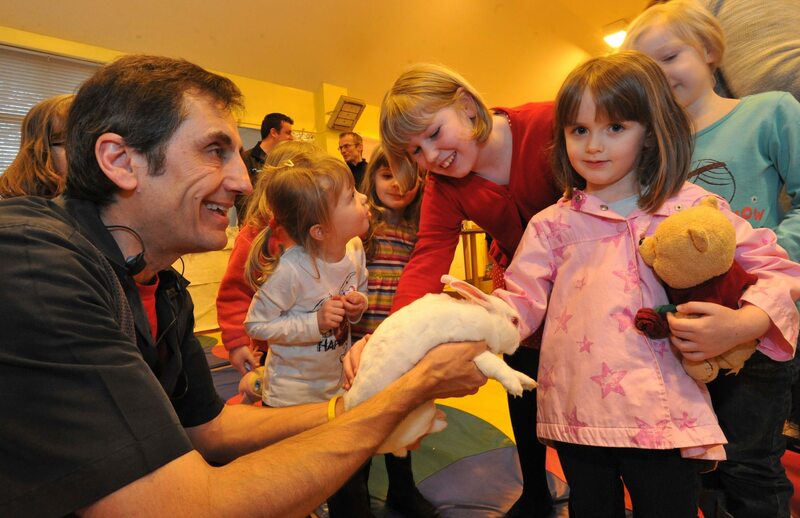 Benny the Bunny - the look on your children's faces when they pet/stroke Benny is amazing. Now that you know the show will be awesome... let's talk about - "at a price you can afford." *Please Note: This special promotion is being offered to all the schools on my mailing list (342), so dates will book faster than a hoover on steroids! So NOW is the time to contact me and snag your whopping £100.00 discounted price before I get sold out. If you prefer, you can also contact me on my office phone: 01387-216-265. Anything else you'd like us to know about your celebration?